Bits of My Own: Happy New Year! Our holidays were a bit subdued this year, Keith had surgery on December 21st, so we were mostly preoccupied with that. The surgery went well, and he is now slowly recovering. 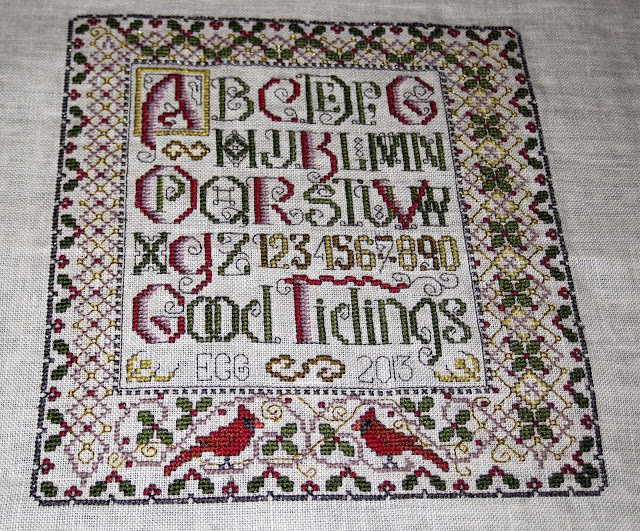 I did finish the Cardinal Sampler, my final finish of 2013. 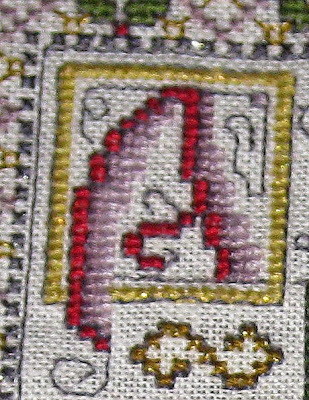 I combined some metallic thread with the DMC for the border and illuminated initial to give it a little sparkle. It didn't show up too well, but you can see a little of the shine in this close-up. I want to get it framed for next Christmas! My next project had to be something really simple. I decided to knit Keith a scarf. I worked on this in the waiting room during his surgery. It had to be a really mindless pattern because I was totally mindless that day! 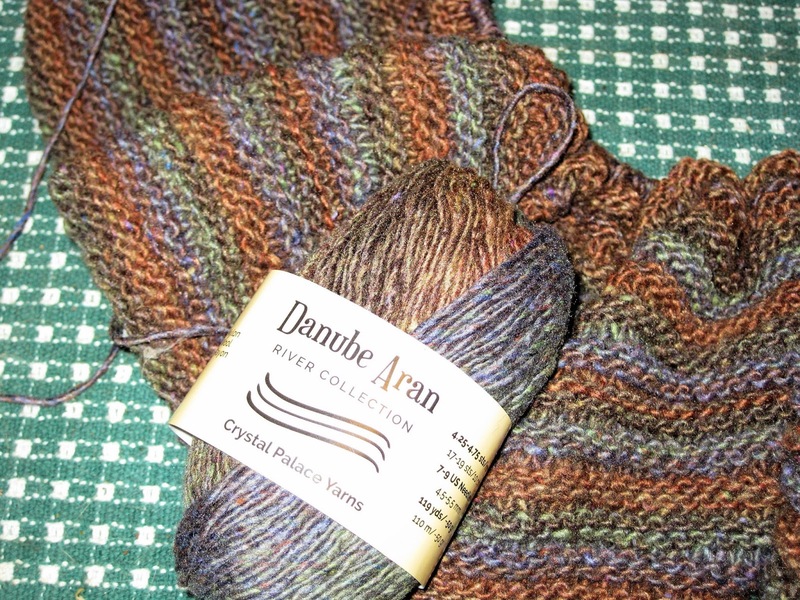 I picked a "self striping" yarn that I saw on ebay. It is a "slow stripe", and is just suited for things like scarves. 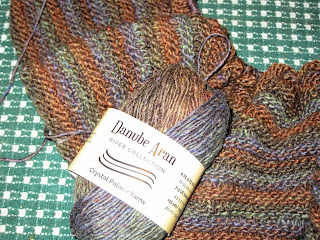 I am knitting the scarf longways so the pattern is more subtle. The pattern is really easy. First knit in a garter stitch for 4 rows, then purl 2 rows, knit 2 rows all the way across. Finish with 4 rows of garter stitch. I believe the color is called "Sherwood Forest". The colors. greens, browns, grays, are favorites of Keith's. I hope he will like it. I have a ways to go, so I doubt that is will be finished in 2013. I was also thinking about knitting a matching hat. When I get a chance, I will be back to re-cap the 2013 finishes. Hope everyone has a very Happy, Healthy New Year! I hope your DH has a quick recovery. Such a bummer to have surgery right before Christmas like that. Love the scarf you are knitting for him. And the finish -- so beautiful! Happy 2014! A beautiful finish! And I love the scarf! Wishing your husband a speedy recovery. Happy New Year! 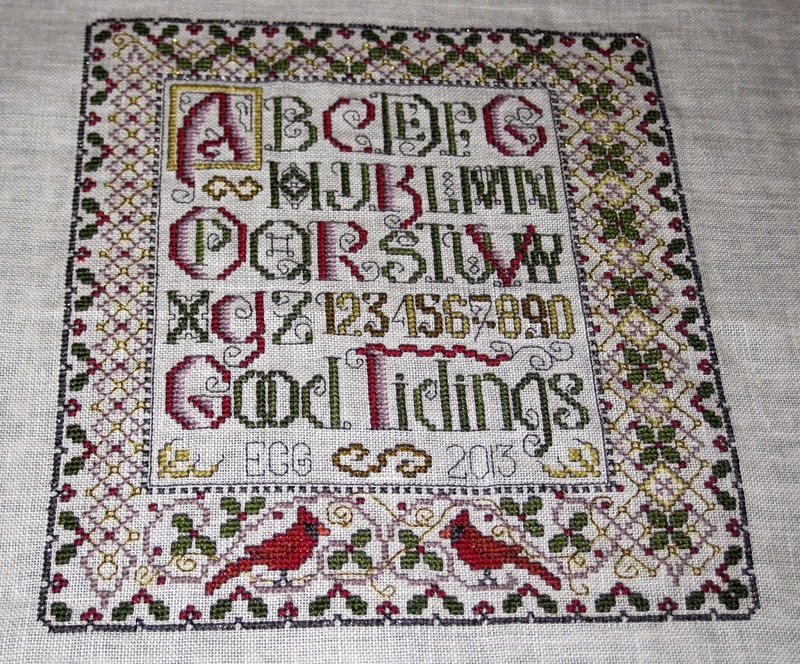 Your cardinal sampler is gorgeous! Congrats and Happy New Year! What a stunning sampler! Congratulations! Wishing you and Happy New Year and a quick recovery for your DH! That is a beautiful finish and what a pretty scarf. Best wishes for your husband's recovery. Congrats on the lovely finish, and have a great 2014. 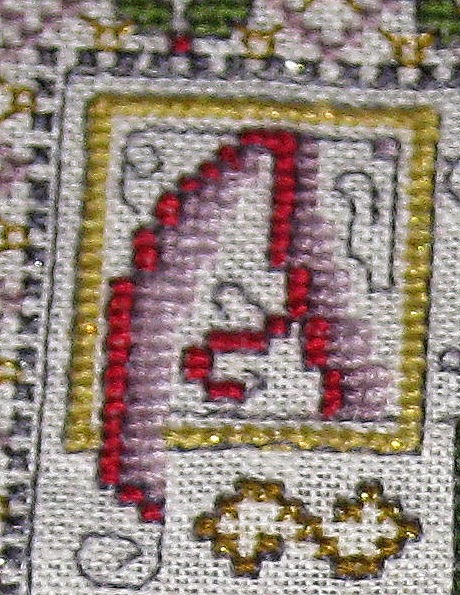 Wow, your Cardinal Sampler is such a beauty. I have always loved Patricia Andrle's designs. And a great knitting project. A matching hat would look good with it. I hope your husband's recovery will continue well. Have a great and happy new year! That is a beautiful scarf you are making and I LOVE the sampler!! Hope your hubby is feeling better quickly! I hope your DH is making a good recovery from surgery.